New Rochelle, NY, December 14, 2018–Breastfeeding for more than 6 months was found to be independently associated with smaller waist circumference in the decade after delivery among women in the POUCHmoms Study. Pregnancy contributes to an accumulation of abdominal adiposity, which is an indicator of cardiometabolic dysfunction in later life. The complete findings regarding the relationship between breastfeeding duration and maternal central adiposity are reported in an article published in Journal of Women’s Health, a peer-reviewed publication from Mary Ann Liebert, Inc., publishers. Click here to read the full-text article free on the Journal of Women’s Health website until January 14, 2019. A total of 678 women from the Pregnancy Outcomes and Community Health (POUCH) cohort participated in the POUCHmoms Study 7-15 years after delivery. The researchers assessed the relationship between waist circumference measured at follow-up and self-reported history of breastfeeding duration. Propensity score approaches were incorporated into the study to account for systematic differences between women who did and did not breastfeed. 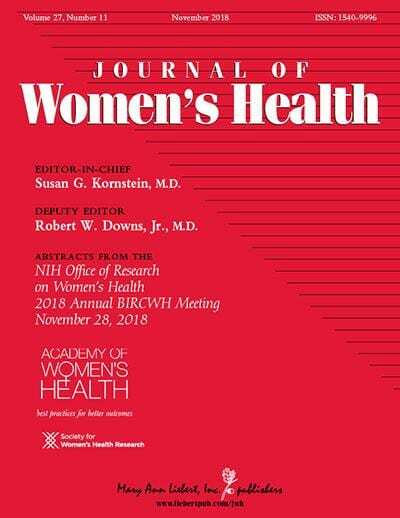 The article, entitled “Breastfeeding Greater than Six Months is Associated with Smaller Maternal Waist Circumference Up to One Decade After Delivery” is co-authored by Gabrielle G. Snyder, MPH and colleagues from the Departments of Epidemiology and Biostatistics, Graduate School of Public Health, University of Pittsburgh (Pennsylvania) and the Department of Epidemiology and Biostatistics, College of Human Medicine, Michigan State University (East Lansing). Research reported in this publication was supported by the National Heart, Lung, and Blood Institute of the National Institutes of Health under Award Number R01-HL103825. The parent POUCH Study was supported by the Eunice Kennedy Shriver National Institute of Child Health and Human Development and the National Institute of Nursing Research (R01 HD034543). The content is solely the responsibility of the authors and does not necessarily represent the official views of the National Institutes of Health.